Since 2000, INFINITY Laser Hair Removal & Skin Rejuvenation has been a leader in Saint Louis for Laser Hair Removal services. As a smaller woman-owned business, you can be assured that you will receive personalized service each and every time you visit us. 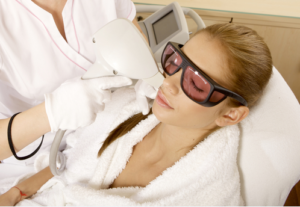 Your safety and comfort are paramount to us and we only employ Registered Nurses and Missouri State Board Licensed Estheticians to perform our laser hair removal and skin rejuvenation services. At INFINITY, your services will be performed by your preferred, licensed technician each and every time you visit INFINITY. INFINITY offers the fastest, most effective way to permanently reduce unwanted hair safely and virtually painless, with smooth, lasting results. The Our Laser TechnologyLight Sheer Diode[/intl isink] High-Speed DUET laser by Lumenis, the ‘gold standard’ designed for all skin types, was the first laser to be approved for Permanent Hair Reduction by the FDA. We offer no obligation, complimentary consultations. Call 314.862.1000 today and start the process of permanently reducing your unwanted hair. You won’t regret it.